Print four different weekly Old Navy coupons to save on your purchases in store through 12/24! Be sure to check out the latest Old Navy online deals too! 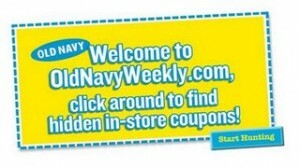 OldNavyWeekly.com has a new format this month, with new in-store deals every day and hidden coupons throughout the site. So far I’ve only found a “Buy an Alpine Hoodie and get $5 off any in-store purchase” coupon, but it sounds like they may be adding additional coupons over time. Your guess is as good as mine as to when that might happen, so we’ll just have to watch and see. Maybe there will be an update from the M80 Newsroom soon with more hints. Note that it appears that you may only select one coupon per week, so choose wisely! Not familiar with the Old Navy Weekly coupon craze? Check out their FAQs to learn how to play the game. Be sure to come back and tell us what you find! Thanks to Josee for sharing this news with me on Facebook! The Old Navy day after Black Friday doorbusters are now available online! Don’t forget you can score FREE shipping on orders over $50. I’d imagine there will be more sales for Cyber Monday, so check back for those! The Old Navy Black Friday doorbusters are now available online! Score FREE shipping on orders over $50. Check back tomorrow for the Saturday online doorbusters! Old Navy is offering 3 days of doorbusters online, and there’s still time to score some great deals today! Save $10 off any $50 purchase with the code ONTENOFF — plus FREE shipping on orders over $50. Check back tomorrow for the Black Friday online doorbusters!